The first Battle of Gaza is a fiasco for the British after the commander, General Charles Dobell, makes the decision to withdraw when his troops are in a position to seize victory. Turkey, encouraged by victory during the first battle last month resolve to stand upon the Gaza-Beersheba line so that by the time the British are prepared to renew their assault, the Gaza fortifications are even stronger than before. The battle becomes another costly defeat for the Allies and results in the dismissal of the commander of the Eastern Expeditionary Force, General Archibald Murray, who has conducted the campaign in Egypt and Palestine since January 1916. In their communications with the War Office, Generals Murray and Dobell, commander of the Eastern Force, have falsely portrayed the first battle of Gaza as a success and gave every indication that a quick resumption of the offensive would have immediate and positive results. Dobell planned a typical Western Front attack with two days of preliminary bombardment followed by a frontal infantry assault on the enemy trenches. The experienced combat commanders, General Philip Chetwode, commander of the British Desert Column, and General Henry Chauvel, commander of the Anzac Mounted Division, are less optimistic about the chances of breaking the Turkish line. The infantry component of General Dobell’s Eastern Force has expanded since the first battle to four infantry divisions the 52nd (Lowland), 53rd (Welsh) and 54th (East Anglian) divisions plus the recently formed 74th (Yeomanry) Division which is made up of brigades of dismounted cavalry serving as infantry. The mobile component remains the Desert Column which comprised the Anzac Mounted Division and the Imperial Mounted Division plus the Imperial Camel Corps Brigade. The 74th Division and Anzac Mounted Division would remain in reserve during the battle. In keeping with the “Western Front” flavor of the battle, the British introduce poison gas and tanks to the eastern battlefield for the first time. Two thousand gas shells and six tanks are available. While the tanks are certain to be deployed, doubts remain about whether to use gas due to operational concerns. It is estimated that the Turkish forces occupying the Gaza-Beersheba defenses number between 20,000 and 25,000. As the infantry attack is about to commence, the guns concentrate on the Ali Muntar strong point, south east of Gaza. This includes the firing of gas shells for the first time. One result of the prolonged bombardment is to provide the Turks with ample warning that a major attack is imminent, giving them plenty of time to finalize their defenses. Another deficiency in the British plan is that all their artillery is concentrated on bombarding the defenses, leaving no guns available for counter-battery work against the Turkish artillery which is therefore uninhibited in its shelling of the Allies line. The attack opens on this morning 07:15 when 53rd Division advances on the extreme left (west) of the front, aiming for the sand dunes between Gaza and the Mediterranean shore. This is followed shortly after by the 52nd Division (155th and 156th Brigades) attacking in the center against Gaza and Ali Muntar and the 54th Division (161st and 162nd Brigades) attacking on the right between Gaza and the “Tank” Redoubt. One of the tanks is destroyed while in support of the infantry. All along the front the infantry are brought to a halt well short of their objectives while suffering heavy casualties from shrapnel shells and machine gun fire. The five surviving tanks are deployed at various points along the front, rather than as a single unit. In most cases, the only discernible effect of their presence is to attract concentrated artillery fire which makes their proximity perilous for the infantry. However, one tank operating to the right of the 54th Division on the front facing a strong redoubt that will become known as “Tank” Redoubt, does enable the infantry to make their most significant gain of the battle. Facing “Tank” Redoubt is the 161st Brigade of the 54th Division. To their right are the two Australian battalions (1st and 3rd) of the Imperial Camel Corps Brigade who have dismounted about 4,000 yards from their objective. As the infantry goes in to attack at 07:30 they are joined by a single tank called “The Nutty” which attracts a great deal of shell fire. The tank follows a wayward path towards the redoubt on the summit of a knoll where it is fired on point blank by four field guns until it is stopped and set alight in the middle of the position. The infantry and the 1st Camel Battalion, having suffered heavy casualties on their approach, now make a bayonet charge against the trenches. About 30 members of the Imperial Camel Corps and 20 members of the Norfolk Regiment reach the redoubt, then occupied by around 600 Turks who immediately break and flee towards their second line of defenses to the rear. The British and Australians hold on unsupported for about two hours by which time most have been wounded. With no reinforcements at hand and a Turkish counter-attack imminent, the survivors attempt to escape back to their own lines. To the right (west) of Tank Redoubt, the 3rd Camel Battalion, advancing in the gap between two redoubts, actually makes the farthest advance of the battle, crossing the Gaza-Beersheba Road and occupying a pair of low hills (dubbed “Jack” and “Jill”). As the advances on their flanks falter, the ‘Camels’ are forced to retreat to avoid being isolated. The eastern-most advance is made against the Atawineh Redoubt and the neighboring Sausage Ridge. This line is made up, from left to right, of the Australian 4th Light Horse Brigade and the 3rd Light Horse Brigades and the 5th Mounted (Yeomanry) Brigade of the Imperial Mounted Division, commanded by General Hodgson. Hodgson’s orders are to ‘demonstrate’ against the Turkish positions to prevent them withdrawing reinforcements to Gaza but also to advance strongly if the opportunity presents itself. Dobell had visions of breaking through the Turkish line on the flanks and sending his mounted reserves through. Consequently the secondary attack upon Atawineh is pushed hard and at great cost in casualties. The 3rd Light Horse Brigade begins its advance before dawn and, attacks along the spine of the Atawineh ridge, manages to approach to within 800 yards of the redoubt before being sighted. However, their advance is premature so that the units on their flanks are still well behind. They manage to close to 500 yards during the day but get no further. The 4th Light Horse and 5th Mounted Brigades manage similar advances on their sectors but nowhere are the Turkish trenches reached and given the inferior position of the attackers, there is no prospect of making a successful bayonet charge. The eastern flank of the British line is guarded by the brigades of the Anzac Mounted Division. The northern-most unit on the flank is the Wellington Mounted Rifle Regiment of the New Zealand Mounted Rifles Brigade whose front lay along Sausage Ridge. They advance in support of the 5th Mounted Brigade. In the afternoon the line of the Imperial Mounted Division is reinforced when the 6th Mounted (Yeomanry) Brigade comes forward from where it has been in reserve. With all reserves committed, there is still no possibility of a successful assault. In fact, so unstressed was the Turkish defense that their artillery has guns to spare for counter-battery work against the horse artillery. By noon the attack has faltered at all points. Any small gains made are too thinly occupied to be held for long. In most places the Turkish defenders are content to hold the British at a distance and inflict casualties as they approach. Only in the west along the coast do they mount a counter-attack to attempt to recapture a position and are defeated by the British. At 15:00 the British headquarters intercepts a Turkish message stating that the Gaza garrison is not in need of reinforcements. By this time the British have committed most of their immediate reserves to the attack so, assuming the message is not a deception, it is clear that there is no prospect of success. The second battle of Gaza is a disastrous defeat for the British. They make no progress, inflict little damage and suffer heavy casualties that they cannot easily afford. The main losses are amongst the British infantry who are called upon to attack the strongest position. For failing to achieve the promised success on the second attempt, both General Murray, Commander-in-Chief of the Palestine campaign, and General Dobell, the army commander of Eastern Force, are quickly replaced. The War Office resolves to supply the Palestine campaign with adequate resources and capable commanders to ensure future success. Murray is replaced by the General Edmund Allenby, whose forces are expanded to contain three full army corps; two of infantry and one mounted. Dobell is replaced by General Chetwode as commander of the Eastern Force. Lieutenant Colonel Bernard Salwey Grissell DSO (commanding 1st/5th Norfolk Regiment) killed at age 37. His brother was killed last September. Lieutenant Colonel Grissell received his commission in the Norfolk Regiment in 1899, and served throughout the South African War, being present at the Relief of Kimberley, and at the Battles of Paardeberg, Poplar Grove, and many other engagements. He received the Queen’s and King’s Medals with five clasps. He was appointed extra ADC to the King during the Indian tour of 1911, and in 1913-14 he was Attaché to the Army Headquarters, India, QMG.’s branch. In 1915 he was appointed DAAG, and the following year he received the DSO, and was given the command of a Territorial Battalion of his own Regiment. Major Walter Torrie Forrest (King’s Own Scottish Borderers) is killed at age 37. He is Rugby Union player for Hawick RFC and capped for Scotland from 1903 to 1905. Second Lieutenant Eric John Gardiner (Norfolk Regiment) killed at age 20. His twin brother will be killed in the sinking of HT Leasowe Castle next year. Lieutenant Charles John Bonar Law (King’s Own Scottish Borderers) is killed at age 20. He is the son of the Right Honorable Andrew Bonar Law, future Prime Minister. His brother will be killed next September. Second Lieutenant Archibald Ainslie (King’s Own Scottish Borderers) is killed at age 23. His brother will be killed next month in France. Privates Charles James and Austin George Rudram (Norfolk Regiment) are killed together in Palestine. Austin dies at age 32. Private George Zachariah Barnard (Norfolk Regiment) is killed at age 25. He is the middle of three brothers who are killed in the Great War. Captain Charles Grant Seely (Hampshire Regiment) is killed leading an advance on a Turkish position at age 22. He is the son of the 2nd Baronet and his younger brother will be killed in May 1943 serving in the Royal Air Force. Their cousin was killed less than one week ago on the Western Front. Captain Eustace Henry Cubitt (Norfolk Regiment) is killed at age 27. His two brothers were killed together on Gallipoli in August 1915. Lieutenant Stephen Gilbert Ratsey (Hampshire Regiment) is killed in action in Palestine at age 24. His two brothers were killed in Gallipoli in August 1915. Rifleman Arthur Stanley Chiverton (Hampshire Regiment) is killed at age 23 at Gaza. His brother will be killed next November. Captain Alexander Kenelm Clark-Kennedy (King’s Own Scottish Borderers) is killed in Palestine at age 33. His brother will be killed in September of next year. Lieutenant Harry Olivier Sumner Gibson (London Regiment) is killed at age 31. He is the grandson of the Reverend Henry Arnold Oliver Rector of Poulshot and the Reverend W Gibson Rector of Fawley and son in law of the Reverend John H Townsend. His first cousin is Lord Laurence Olivier and is an enthusiastic Alpinist. Second Lieutenant Alexander Tweedie (King’s Own Scottish Borderers) is killed at age 34 two days after his brother was killed on the Western Front. Second Lieutenant ‘The Reverend’ William Barton Campbell (King’s Own Scottish Borderers) is killed. His brother will be killed in two weeks. 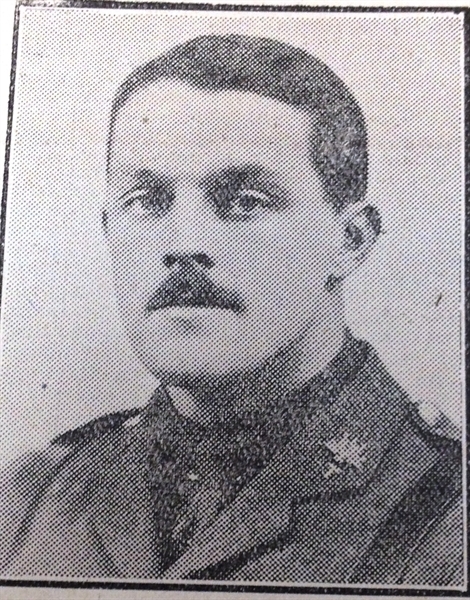 Captain A E Beck MC (Norfolk Regiment) is killed in Palestine at age 31. His two brothers are also lost in the Great War the first in August 1915 the other in August of this year. Major St John Lucius O’Brien Acheson ffrench Blake (Lancers, Indian Army attached Worcestershire Hussars) is killed in Palestine at age 28. He is the son of the Reverend Robert ffrench Blake who will have another son killed in North Africa in May 1943. Captain Henry Ivan De Burgh Wilson (Queen’s Own Royal West Kent Regiment) is killed in action at age 30. He is the son of Surgeon General ‘Sir’ William Wilson KCMG. Captain Robert Leslie Murray (Northamptonshire Regiment) is killed in Palestine at age 24. He is the son of the late Reverend Arthur H Murray. Second Lieutenant Geoffrey George Leadbitter (Northamptonshire Regiment) is killed. He is the son of the Reverend Dr. William Oram Leadbiter Rector of West Walton. Lance Corporal Phillip John Woodman Burros (Northamptonshire Regiment) is killed at age 18. He is the son of the Reverend T S Burros. Lieutenant Frank Eric Throssell (Australian Light Horse) is killed in action at age 34. His brother, a Victoria Cross winner at Gallipoli, is wounded in the same action. Trooper Solas Nassau (Imperial Camel Corps) is killed in Gaza at age 30. He is the foster son of the Reverend F B Oldham. The merchant vessel S S Sowwell (Alexander Frederic Walton) is sunk by a torpedo 170 west of Gibraltar. Twenty-one including the master are killed. Lieutenant Harold Francis Hughes-Gibb (Royal Field Artillery) is killed in action at age 25. His older brother has been killed while also serving in the Royal Field Artillery in 1916. Second Lieutenant Charles Leslie Symond (Royal Engineers) is killed at age 18. His brother will die on service in February 1919. Second Lieutenant Jack E Hewison (Royal Scots) is dies of wounds at age 21. He is the son of the Reverend John R Hewison, former pastor at Somersham Baptist Chapel. Sergeant Ralph Murray Elrington (Australian Infantry) is killed in action at age 22. His older brother will be killed in three weeks. Corporal Thomas Stanley Brighton (Norfolk Regiment) is killed at age 37. He is one of four sons of Truman and Agnes Brighton who fell in the Greatl War. Lance Corporal John Albert Crane (Northamptonshire Regiment) is killed at age 28. He is the middle of three brothers who will be killed in the Great War. Private Alexander Stewart (Argyll and Sutherland Highlanders) is killed in action. He was a member of the Bonnybridge and East Stirling Cricket clubs. Private Alfred Charles Doubleday (Essex Regiment) is killed at age 23. His brother will be killed in September 1918. Private Frederick Parkins (Bedfordshire Regiment) is killed at age 34. His brother will be killed in August 1918. Private James Hancock (Bedfordshire Regiment) is killed. His brother was killed in May 1915. Private Alfred Thomas Emmerson (Border Regiment) is killed at age 27. He is the musical director of the Devonshire Park Theatre Eastbourne. Private Alexander Reid (Central Ontario Regiment) dies of wounds at age 24. He is the second of four brothers who are killed in the war.